One of my favorite “side” elements of the Star Wars universe has always been the Mandalorians. A once proud, powerful warrior culture that has been pushed to the wayside during this whole wars of stars, Mandalorians fascinate me because they represent this scattered society trying to find relevance again. There are various sects of extremists, loyalists, pacifists, neutrals, and mercenaries, all desperately trying to cling to or grab onto power by any means necessary. They add a rich and unique outside perspective to the conflict between the Empire and the rebels (or the Republic and Separatists, depending on how long you wish to stretch the timeline). So going back to them for “Imperial Super Commandos” potentially hits all my favorite geek spots, especially against the backdrop of everything that’s been developed so far this season. Unfortunately, Christopher Yost’s script grows cold feet. He’s not interested in getting deep or informative. Every opportunity that comes up where we could get some more details about Mandalorians is undercut or cast aside. Every time Ezra asks for more information about them, he’s knocked out, or he’s dismissed with a vague “It’s… complicated,” or, by the end, he sums it up with a “Don’t take this the wrong way, but you Mandalorians are crazy.” I mean, they’re not, but Yost sums it up as such, and it’s deflating. 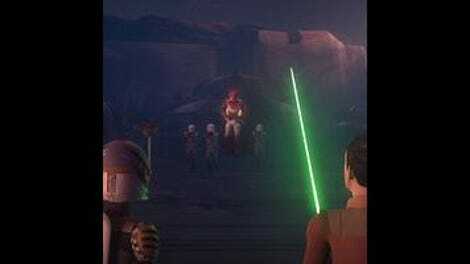 Or take for instance the scene where Gar Saxon faces Ezra and Sabine after Fenn Rau escapes in the Phantom Two. He gets into a long, interesting speech about Sabine’s mother and her relationship to the Vizsla clan and Sabine herself. It’s new, potentially deep stuff, but Sabine’s reactions to this information is so dismissive that I’m not sure how we’re supposed to respond. Is this information true? Is there a spark of truth to it? How does Sabine feel about her abandonment of her Mandalorian heritage, and the mutual estrangement between her and her mother, which caused her to turn to the Empire (again, if this is true)? Sabine spends most of the episode rather unaffected by all this information tossed around. There’s definitely an argument that Sabine’s commitment to the Ghost crew and the rebellion is so absolute that she stands above any regret or shame of her Mandalorian history, loyalty or cultural/familial commitment. Show us that! Or, hell, even tell us that. The episode is filled with expositional dialogue (which is a general Star Wars thing, so I tend not to dwell on it too much), so adding a line where Sabine stands firm in her loyalty to the rebellion would, at the very least, give Sabine some kind of emotional response to the information that we learn here. “Imperial Super Commandos” isn’t a bad episode (except that title) but it is odd how it downplays a lot of its significance in order to produce a pretty straight-forward story. Following up on the events from “The Protector Of Concord Dawn,” Sabine wants to convert the captured Fenn Rau to the rebel side. But before she can do that, the rebels need to investigate the Concord Dawn route since they’ve not received any signals from the Mandalorians there. Hera dispatches Sabine, Ezra, Chopper, and Fenn Rau to investigate (and I’m going to get into this bizarre decision in the Stray Observations). This is where Ezra stupidly lets Rau knock him and Sabine out and escape, only for all three of them to look upon the destruction of Concord Dawn and Rau’s massacred Mandalorian clan–and the encroaching Mandalorian clan that sided with the Empire, led by Saxon. 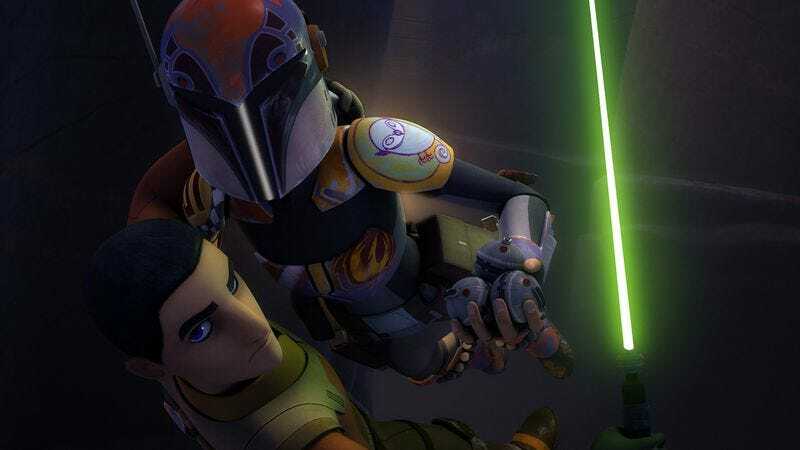 At this point, the episode gets into a number of ruminations and discussions about various things: taking advantage of Ezra’s sacrifice, questioning Sabine’s loyalty, raging over whether it’s Rau’s or Sabine’s fault that the Concord Dawn Mandalorians were killed. It all falls flat because at no point does the script commit to any of it. Ezra wasn’t sacrificed. Sabine expresses no concern over anything Mandalorian-related. Saxon was planning to kill everyone anyway (but this was way obvious so I’m confused as to why Rau dismayed by this). It all leads to some muddled reasoning once Rau does decide to join the rebels. He admires Sabine’s commitment to saving Ezra, but it’s not a dramatic beat that feels efficiently earned. He doesn’t even see Sabine at her best, which theoretically would have worked better. And Sabine is at her best. The third act is by far the strongest part of this episode, as it leads not only to a clever method to escape the Super Commandos (Chopper squealing into frequency 3-3-7), but also the best sequence in the season so far. The jet pack chase was a hoot, with tense, smart action and luck-based comic moments that made for one enjoyable watch. Ezra bouncing mid-air between the various characters was fun, and between him and Sabine, they put up an admirable fight. I particularly loved how Saxon’s command of cutting them off actually worked, which eventually led to the second Sabine beatdown of the season. I think you can make a strong argument here that Sabine’s physical fighting prowess is becoming a significant part of her character. Letting her actions in this third act define her more than any actual words or dialogue is a bold strategy, a bit of nuance that showcases her as both a true rebel and a true Mandalorian–in that you can’t separate the two. (Perhaps that is what inspires Rau to join the rebellion.) What the narrative fails to do is somewhat accomplished by the visuals, which is fine; if “Imperial Super Commandos” applied that to the episode as a whole, though, it would have been a different matter. Speaking of “strategy”: it kind of feels like that’s going to be a theme this season, but it’s being used sporadically, and it doesn’t quite apply much to this episode. I like the strategy vs. loose cannon undercurrents, but it be nice to see this utilized more. Okay, so, Hera sending Ezra, Hera, Rau, and Chopper on this mission is utterly inexplicable. Sabine and (somewhat) Rau is understandable, but Ezra? Who Hera put on ice after his failures from the pilot episode? Kanan may be blind but it’s clear that he’s still capable, and he was deeply involved in “Concord Dawn,” so this should have been his mission. Also, it’s not like Zeb has been up to anything all season. The writers forced this only to have Ezra involved, and it’s distracting. Speaking of Ezra, I’m not digging how he’s being portrayed this season. Last season, Ezra was a naive but ultimately helpful apprentice. This season, he’s a smarmy, arrogant screw-up, which wouldn’t be so bad if the show tempered his actions or responsibilities. He doesn’t seem tempted by any more Dark Side urges, nor has he been adequately “punished” for his mistakes, since he’s just keep being sent on more missions. I hope this is leading somewhere. During the Ezra/Saxon interrogation scene (which was poorly handled for a lot of reason), Saxon says something like “every lie you tell reveals more truth than you know.” This doesn’t make a lick of sense. It’s a solid sentiment but Saxon actually doesn’t reveal he learned anything new from Ezra’s lies. This was placed in the script because it sounded cool, not because Saxon is a great reader of people.